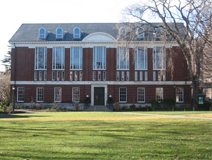 The renovation of the 24,000 square foot Arthur and Elizabeth Schlesinger Library at the Radcliffe Institute for Advanced Study was completed in February 2005.The Schlesinger project was designed to facilitate its use by librarians and patrons while meeting the needs of a modern special collections library and restoring some of the building's character. with the only significant changes being the addition of an accessible ramp to the main entrance and addition of interior storms to the windows. The few original interior elements, including a stained glass window and marble stair, were protected and restored. One highlight was restoring part of the second floor to a double-height daylit reading space. Many of the decisions made to protect the collections were also sustainable choices. New material selection was based on function as well as minimizing off-gassing to protect the occupants and the collection. In addition, the mechanical system was carefully designed to minimize the chance of mold growth and particulate contamination while improving energy efficiency. Commissioning was also critical throughout the design and construction process, given the complex mechanical system and requirements to maintain proper temperature and humidity throughout the building. From the outset a major goal of the project was to minimize construction waste. Using a number of avenues, the project was able to not only recycle most of the construction waste, but also be able to redistribute and donate a large portion of the furniture, cabinets, fixtures, and doors. This work, done in conjunction with Harvard University and the Institutional Recycling Network, allowed for a recycling rate of over 90%.